The World Health Organisation (WHO) - recommended REPLACE initiative can help cut deaths. Given India’s disease burden of non-communicable diseases and also the urban movement towards healthier foods, this movement is vital for the country to prevent diseases, and the compromised quality of life and deaths caused due to transfats. The REPLACE action package will provide governments with a strategy to achieve the prompt, complete, and sustained elimination of industrially-produced trans-fat from their national food supplies. Fortunately, the Government of India has indicated their commitment to eliminating industrially produced transfat in advance of the WHO target date of 2023. We know research shows that reducing trans fat in our diet helps reduce risk of heart disease, but how and why? Let's try to clear up the confusion about trans fats. There are two broad types of trans fats found in foods: naturally-occurring and artificial trans fats. Naturally-occurring trans fats are produced in the gut of some animals and foods made from these animals (e.g., milk and meat products) may contain small quantities of these fats. Artificial trans fats (or trans fatty acids) are created in an industrial process that adds hydrogen to liquid vegetable oils to make them more solid. The primary dietary source for trans fats in processed food is “partially hydrogenated oils. Why do some companies use trans fats? Trans fats are easy to use, inexpensive to produce and last a long time. Trans fats give foods a desirable taste and texture. How do trans fats affect my health? What can be done at home to cut out transfat from our diets? 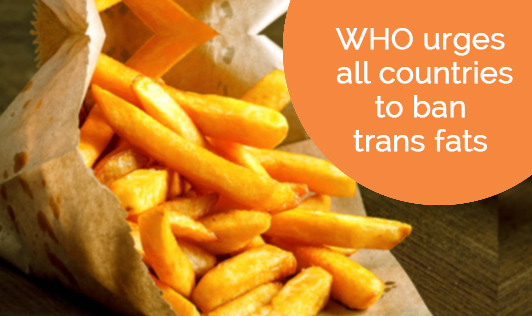 This is a matter for the government to ensure that transfat is out of the food supply. But families can choose healthier oils such as sunflower, canola, soybean, and olive and nut oils. Also, consume more vegetables and fruits and limit fried foods, salt and sugar.